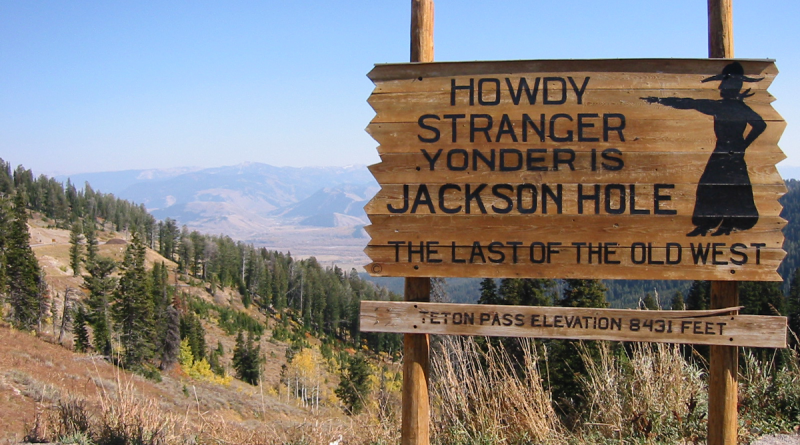 Jackson Hole, which calls itself “The Last of The Old West,” is ever-changing. Once a place for cattle ranchers and dude wranglers, the valley now attracts jet-setting skiers, adventurers and vacation-home investors. Regardless of the mix of its residents, horses remain central to the community’s identity. Reverence for the horse in modern-day Jackson can be seen on any walk around downtown. From the Million Dollar Cowboy Bar’s neon-rimmed bronc sign on Cache Street to the oil and charcoal iterations that line the walls of art galleries nestled between Deloney and Pearl avenues, equine iconography is celebrated here. Even east in Teton Village, ski lifts at Jackson Hole Mountain Resort are emblazoned with a bucking horse logo. And, of course, the state’s license plate has long featured a bucking bronc. 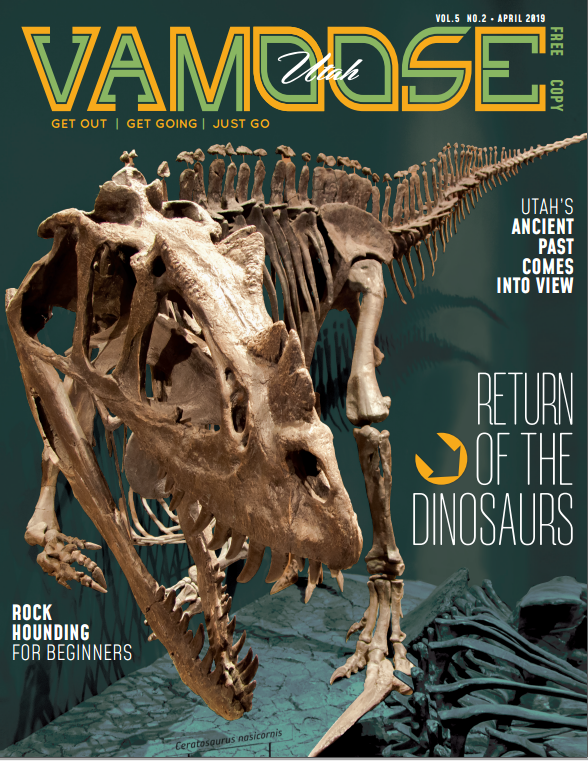 But beyond artistic renderings along downtown’s busy wooden boardwalks, Jackson is still a place where visitors and locals have plenty of tangible, exploratory ways to connect with living horses. Here are a few ways to get an equine fix. The Jackson Hole Rodeo is a rarity, even by the standards of other Western towns. 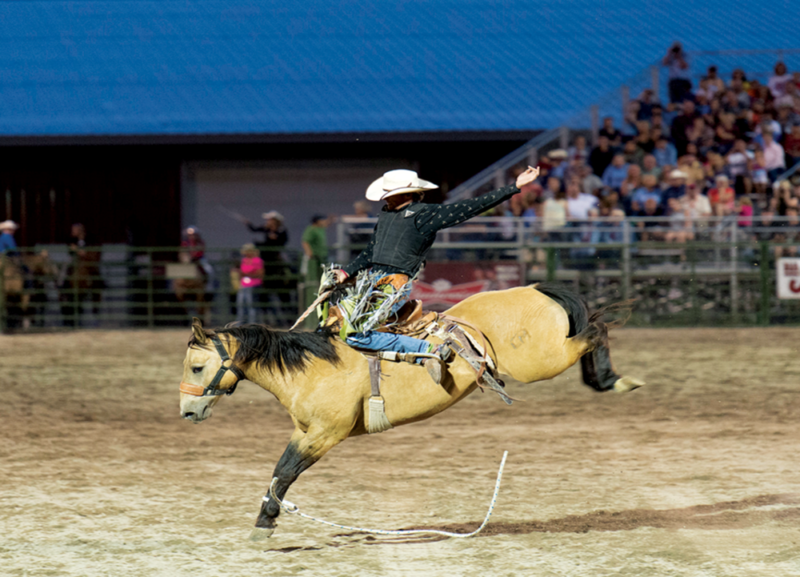 True, many towns host an entertaining rodeo or two during the summer months, but the Jackson Hole Rodeo puts on more than 35 action-packed events each season, with as many as three a week in the peak months of July and August. At each rodeo, spectators are treated to performances of all the standard rodeo events, including calf roping, rough stock riding and barrel racing. This rodeo is also unique in that the cowboys and cowgirls aren’t today’s top rodeo stars making a stop along the high-dollar professional circuit. Instead, they’re the local Wilson family that’s been running the rodeo for more than 100 years. Many a local who’s made it big with their equine counterparts, or who has gone on to showcase his or her riding skills through eight seconds of bucks and turns on the national stage, got started and perfected techniques in front of Jackson visitors. Located at the base of Snow King resort, the rodeo is an easy walk from downtown Jackson. The show runs rain or shine, starting at 8 p.m. with crowds arriving around 7:15 p.m. Show up early for good seating or reserve your seats in advance online. Tickets are $15; children 2 and younger are free. 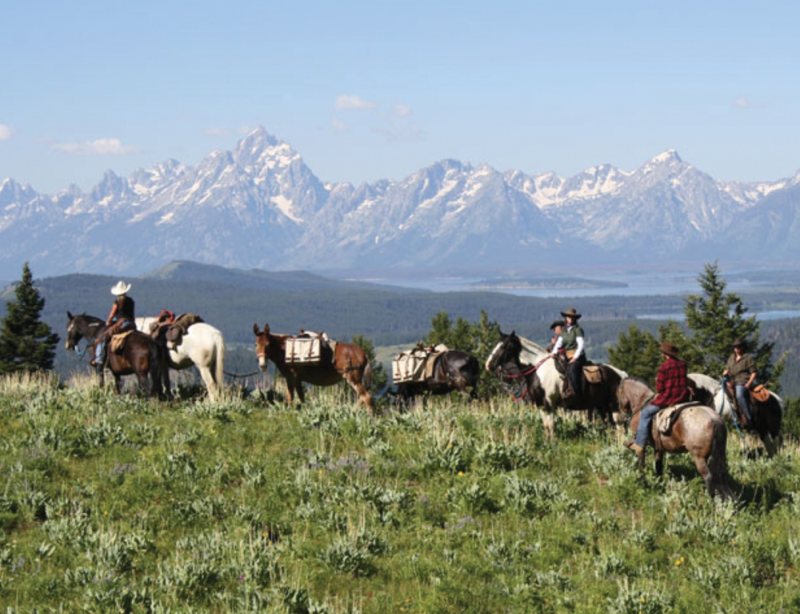 Taking in views of the Tetons and admiring its range of wildlife from horseback is a family-friendly event that’s easy to fit in to a weekend in Jackson and one that will be remembered for a lifetime. It’s the perfect way pacify the horse-crazy kids in the family while giving Dad an excuse to embarrass them as he recites classic John Wayne movie quotes from the saddle. Guide services generally offer one- to four-hour rides at locations throughout the valley. Choose from riding through the Snake River Canyon, across the Bridger-Teton National Forest’s high-mountain meadows, and along pristine lakes under the shadow of the Tetons’ peaks, just to name a few. Guests are matched with a mount that suits their experience in the saddle, and even a timid first-time rider can find his or her gentle giant before hitting the trail with at least one wrangler who’ll serve as both tour guide and help riders navigate their horses along the way (though most services require kids on trail rides be 8 years old or older). Many trail-ride services have started bundling their rides with other activities—from chuckwagon dinners to rafting trips—and are willing to accommodate special requests when booked in advance. In addition, visitors who want a horse-powered activity but might not looking for time in the saddle can take advantage of wagon rides available on many trail rides. Horses, not gunslingers, gather at the A-OK Corral, where the Horse Creek Ranch offers one- to three-hour horseback rides along mountain trails just south of Jackson Hole. Rides depart from Jackson Lake Lodge, Colter Bay Village, Headwaters Lodge and Jenny Lake Lodge Corrals. Beginners are welcome. They also offer wagon rides out of Colter Bay Village with breakfast or dinner. Dry Ridge Outfitters’ one- to four-hour trail rides are offered on the Idaho side of Teton Mountain Range in the Targhee National Forest. You’ll leave from the south side of Teton Valley, riding through aspen and lodgepole forests with views of the canyon, the Big Hole Mountain Range and Teton Basin. 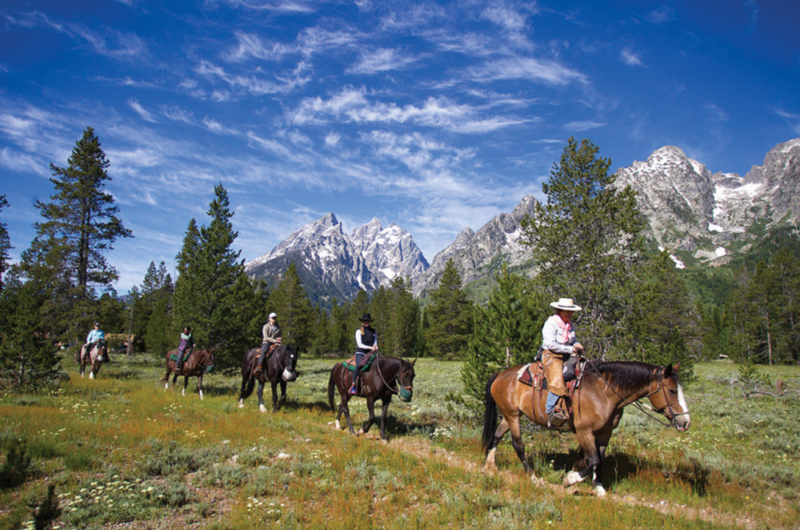 They also offer full-day extended trail rides in Wyoming, Idaho and Yellowstone. Jackson Hole boasts some of the country’s most dramatic backcountry wilderness, where you’ll find unmatched camping, hiking and wildlife viewing as well as hunting and fishing opportunities. To get deep into and out of that gorgeous backcountry without a misadventure is an entirely different feat that might be best accomplished with expert guides. Being atop a horse while venturing into the backcountry (and bringing along a second horse to carry your gear) sure helps, too. Not only do horses or mules relieve the burden of having to physically carry camp supplies for several days, but they also provide guests with hours in the saddle and the perfect vantage point for taking in the scenery. Most outfitter services in the area offer destination-based pack trips, where visitors ride to a campsite and stake out alongside their mounts for a day or two before saddling up and riding back to town. In addition, guides offer progressive trips, where the camp is broken down each day before packing it to the next predetermined campsite. Worried about roughing it too much? Camp generally consists of canvas tents to protect riders from the elements, often with stoves to provide extra warmth on cool nights and campfires around which guides cook gourmet meals for guests. Based on the outfitter, pack trips span from one night to upward of a week and can be tailored to accommodate the guests’ interests. Pack trips connect riders to some of the most remote hunting and fishing terrain in the West, which means many outfitters now offer professional fly-fishing and hunting guides. Many even facilitate photography workshops and wildflower tours along the trail. Shoal Creek Outfitters specializes in customizable pack trips for every level of rider looking for a world-class hunting or angling opportunity with guides and horses that are familiar with the extensive area they access. 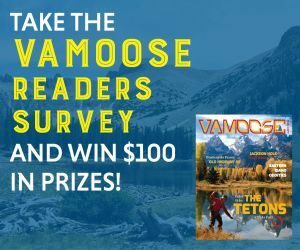 Guides share their insights on catching trophy trout in two unique drainage systems and a high mountain lake that is the head of Shoal Creek, as well as multi-species big game hunting in the Teton-Bridger National Forest and Gros Ventre Wilderness. Owned and operated by a family with six generations of backcountry experience, Swift Creek Outfitters runs a string of more than 100 horses and mules, all of which the family own and many of which they’ve raised themselves. Based between Teton and Yellowstone national parks north of the Moran Junction, Swift Creek’s pack trips depart to destinations in the bordering Bridger-Teton National Forest that include such scenic fishing areas as Pacific Creek, Two Ocean Pass, Bridger Lake and Yellowstone Meadow.